Whether you love livin’ in the city or want a suburban home, get what you need to survive in your local scene. 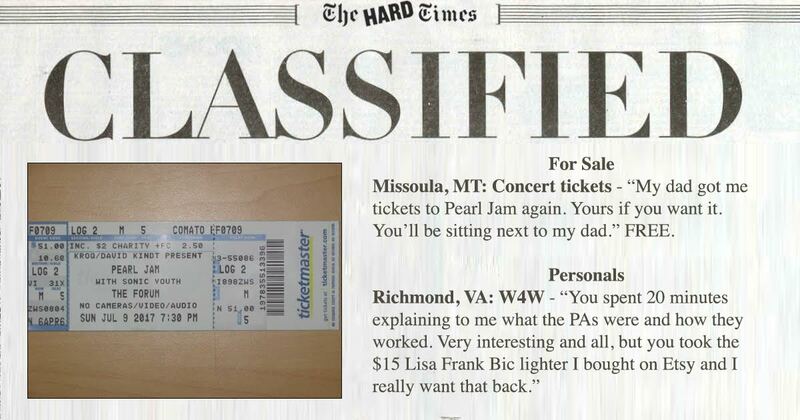 Missoula, MT: Concert tickets – “My dad got me tickets to Pearl Jam again. Yours if you want it. You’ll be sitting next to my dad.” FREE. Keep up with the best shows happening in your home town. Saturday, 10/1/16, Brooklyn, NY @ Bell Jar: “A Night of Punk Classics: Blink 182 Covering NOFX Covering Pennywise.” Doors 7:30 a.m. $80 adv/$95 at door. Tuesday, 10/4/16, Kansas City, MO @ Donnie’s Downtown: “3rd Annual High Roller Swap Meet. Bring your small, valuable collectables! Featuring Kleptomaniax (NOLA), Sticky Fingers, the Shoplifters.” 1 p.m. Will be searched upon entrance. Friday, 10/7/16, Worcester, MA @ The Spot: Closed for renovation.